The villain in Thunderball, Emilio Largo (Adolfo Celi), channels Humphrey Bogart in Casablanca in his ivory double-breasted, shawl-collar dinner jacket. 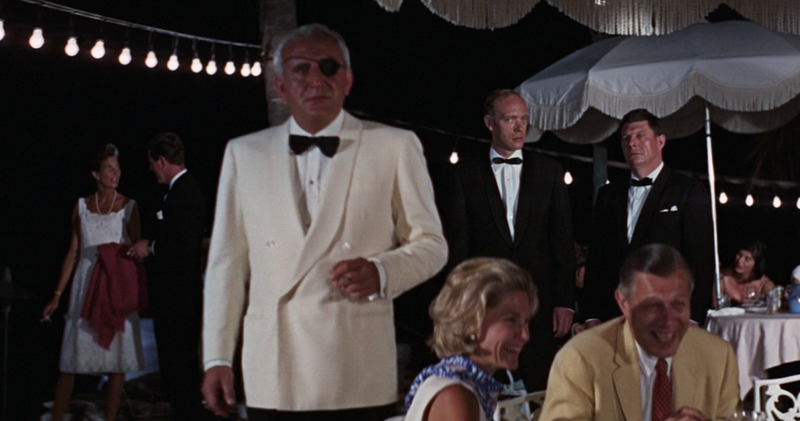 Largo wears a ivory dinner jacket to contrast with Bond’s midnight blue dinner suit. The dinner jacket has a clean chest and wide shoulders with roped sleeve heads. The front has four buttons: button one, show two. It is detailed with four-button cuffs, jetted pockets and no vents. The buttons are mother of pearl. The black trousers have double forward pleats, suspended by white clip-on braces with brass hardware. Largo’s dress shirt has a plain white spread collar, double cuffs and a narrow-pleated front. The shirt body is made in a white-on-white cotton. The front placket closes with two studs. Largo wears two black bow ties: a regular thistle and a narrower thistle with diamond ends. His black calf shoes have elastic gussets on the sides of the instep and either a plain or cap chiselled toe. G. J. Cleverly & Co. are known for making such a style, but Largo’s may have been made elsewhere. The shoes are elegant enough to pass with black tie, but they are versatile enough that the modern man can wear them with jeans. Clip-on braces…definitely a villain! Strange thing, that 2-stud shirt, I thought 4 was a standard and had never seen anything like that. I've seen 1 stud with white tie in some old pictures. With black tie, the standard was traditionally for 3 studs. 4 studs is a recent thing to accommodate low-rise trousers. 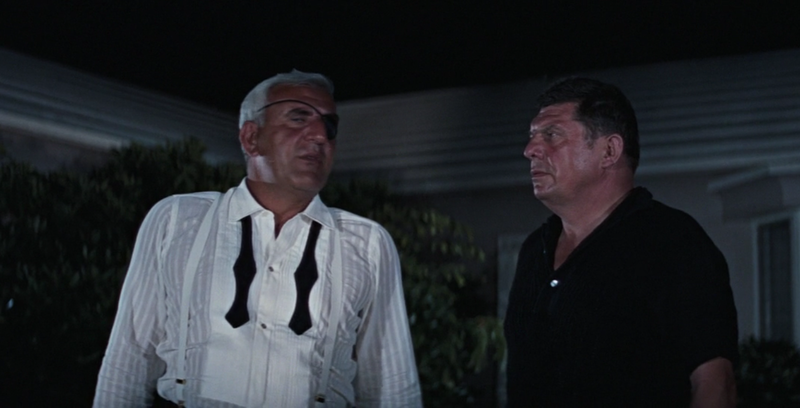 And the eyepatch goes well with the tie and a nice contrast to the jacket! 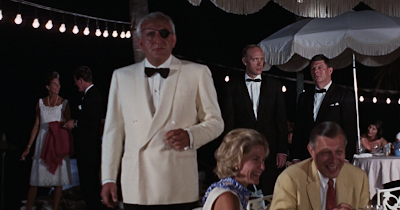 More villains please – the Blofelds, Scaramanga's white suit, and (if you get bear such a thing) Emile Locque's unorthodox double breasted suit. Sorry I left out the eye patch. 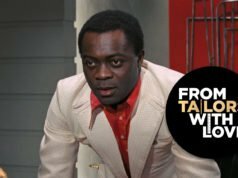 Adolfo Celi was also in OK Connery, a bond spoof staring Neil Connery. Daniela Bianchi, Bernard Lee, Lois Maxwell and Anthony Dawson were also in it. Perhaps one day I'll write something on Neil Connery's clothes in that film. Indeed, the eyepatch makes the outfit. 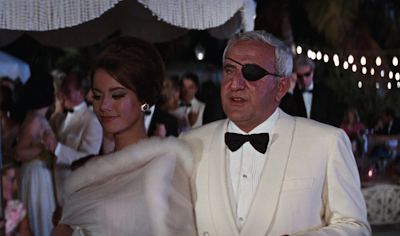 Adolfo Celi as Emilio Largo is one of my favorite Bond villains. Right from the start, he cuts a stylish figure as we first see him on a Parisian street emerging from his Thunderbird with an overcoat draped over his shoulders in the Italian manner. 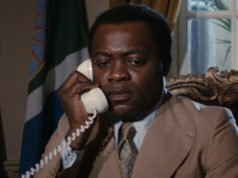 Signor Celi pretty much reprised this same role (even to having a yacht as a base of operations) in the character of Ralph Valmont in Danger: Diabolik in 1968. In between, he played Enzo Ferrari in Grand Prix; certainly a plum role for an Italian actor! Don't forget the most attractive accessory on his arm, Claudine Auger. Wowzers. 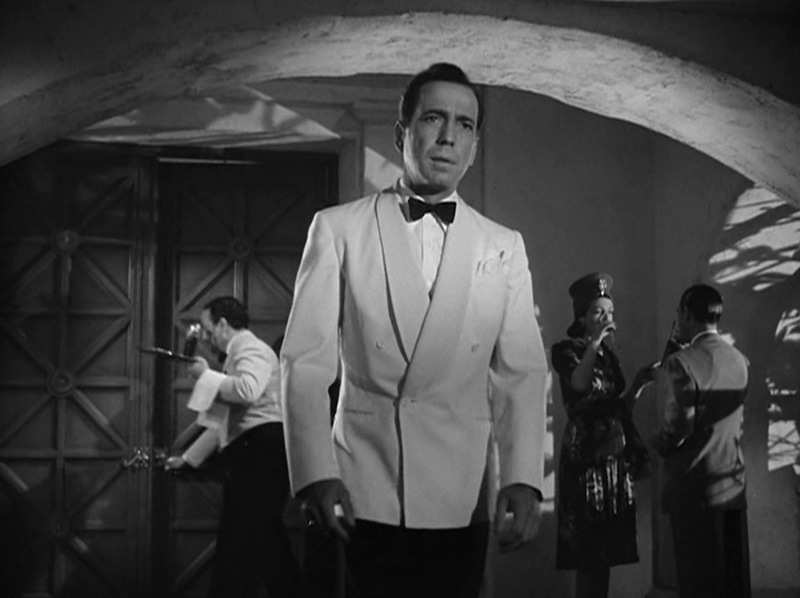 Matt – great point that Largo is channeling Bogey. A great look for the villain (Domino included). Adolfo Celi, one of the most underrated actors in the Italian Movie history. Great pick! Would love to find an Emilio Largo, Ivory Dinner Jacket, size 44 Long, new or used, or a source where I could have one tailor made. 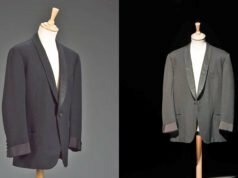 Recently Oliver Wicks has added a 4-with-1-to-button double-breasted dinner jacket design to their lineup. I have a peaked lapel ivory dinner jacket that they released in that 007-themed project you did with them a few years ago and I’ve been very happy with it. I am curious what you think of the proportions and general design of this new double-breasted jacket, as I am considering having them make me one in the same 110’s ivory wool fabric. Particularly in terms of the cut of the lapels it seems to me to be something very different from what Largo is wearing in Thunderball, and more similar to what Bogie wears in Casablanca. I think Oliver Wicks did a fantastic job with the cut. Very Casablanca indeed. Whatever you do, please don’t get a blue sharkskin dinner suit! And thank you as always for generously sharing your opinion.